The first ever books in the world were the Egyptian papyrus rolls, which were composed of several columns of ancient writing scripts. The first of these manuscripts goes back as far as the 25th BC, and until the Christian era, they remained quite popular. However, during this period, the paper or the book industry underwent a transformation, and parchment started replacing the Egyptian papyrus rolls (more on Egyptian Papyrus Rolls on Wikipedia). Writing on parchments was arranged in parallel columns, and vertical lines were used to separate one column from another. This particular pattern gave rise to the idea of cutting the parchments into flat panels, which comprised of either three or four columns. Later on, this form evolved into the books we see today. Books have been part of the world since the early ages, and so the need to bind them together has also been present since then. In the olden days, a much different binding concept was used than what exists today. The Egyptian papyrus rolls were stored in a tubular binding as shown in figure 1. The parchments were also often wrapped up in a roll, and secured with a ribbon. 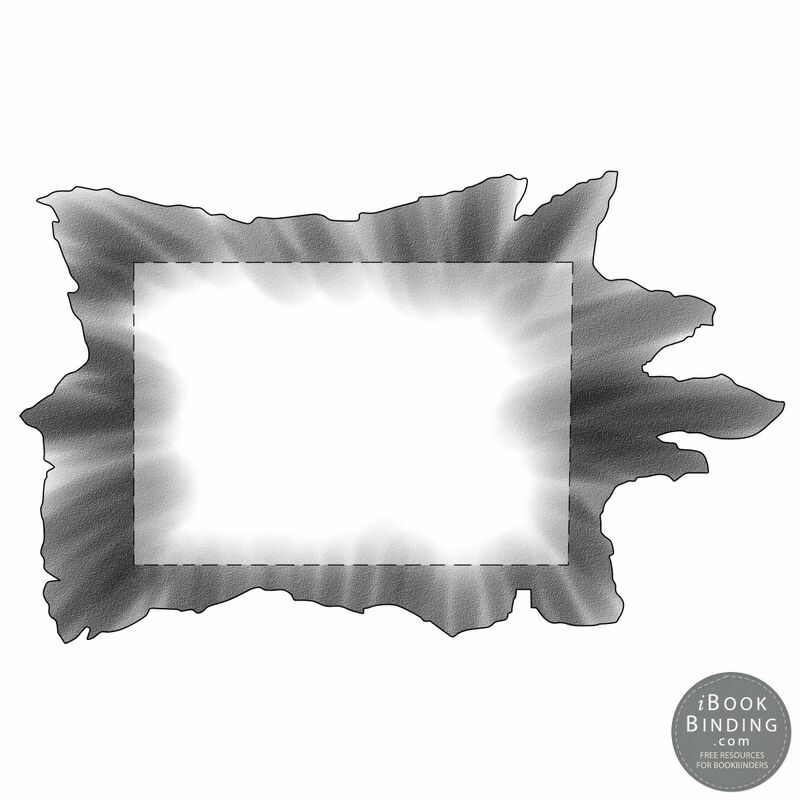 However, when parchments started being cut into paneled forms, the binding also evolved. The new binding was more convenient to use and remained durable for longer than the tubular form. As such, it became the preferred choice. In the beginning, the paneled parchments were hinged along any one of the edges, and were bounded with stitches or a lacing. The columnar arrangement of writing was prevalent even at that time, particularly so for the Latin books. Generally, the Romans used three to four columns to separate content on a single parchment. This style has been transferred down the generations, and exists even today. Several published papers, journals, textbooks and reference books have pages that have been divided into two or three columns. Adopting this style makes the text easier and quicker to read. There are also many books which differ from this, and consist of only a single column. As such, their sizes are also reduced so that the text becomes more legible. Figure 2. An example of a large animal skin used for binding. The bindings that were used in the olden days comprised of pretty much the same components as the bindings that are seen on books today. The books comprised of folded pieces of parchment that were assembled into a single pile and sewn together. Cords on the back of the pages provided more support to the books. The size of the books was large, an inspiration from the huge skins that were used to make the parchments. An example of this sort of book is shown in figure 2. As time passed, the bindings were further modified. Wooden boards were added on the front and the back to protect the pages, but they were not sewn onto the cords. Later onwards, the cords themselves were laced through the edges of the wooden board. This gave rise to a more durable and compact form of book as depicted in figure 3b. The final modification occurred when the wooden boards were removed and a leather sheet was used to cover the entire book, concealing the inner cords, sewing and the hinges. The resulting form enjoyed not only durability and protection, but was convenient as well. Shown in figure 4, this form of book was very similar to the books that are seen today. Figure 4. Early example of a leather bound book. 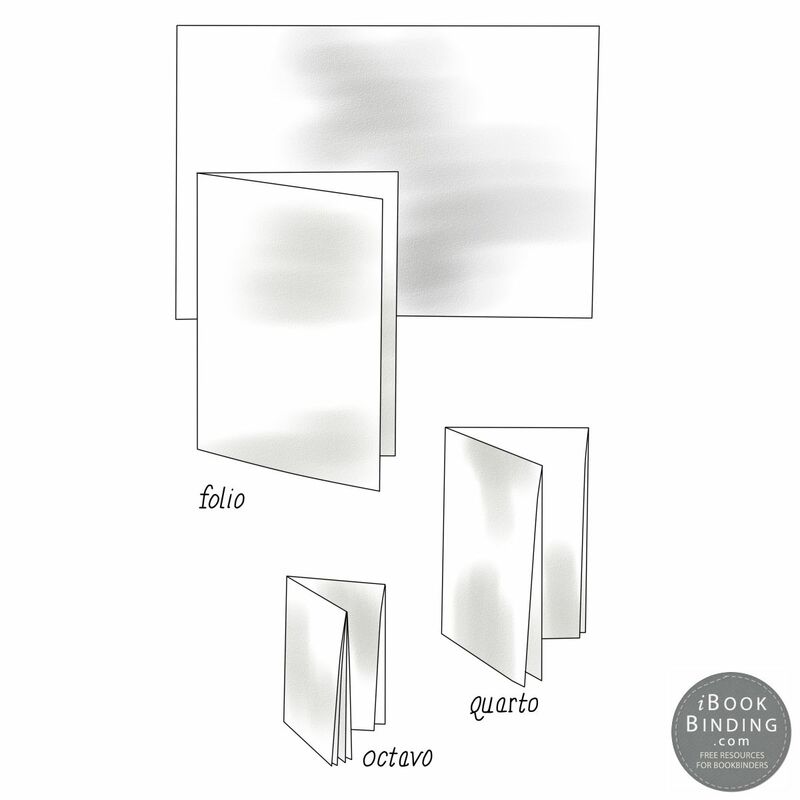 The process of bookbinding development has its own simplicities and complexities. For the last eighteen hundred years or so, the basic book construction has not undergone any major changes. This is very easily noticeable if traditional and modern books are compared. Just like the olden days, even today’s books have pages that are folded and sewn over each other. These pages are then placed into two boards, which are also attached with the rest of the book onto the hinges, such that all the binding and sewing is concealed below them. As history has always shown, every process, method or technology is always influenced by other factors, whether they are directly related or not. Similarly, throughout the ages several events affected bookbinding even though they did not have much to do with literature. During the Middle Ages, knowledge was preserved and guarded by the monastic order. Since these people had access to all the text and material, they took up the bookbinding task. They had the wisdom and were extremely skilled with arts and crafts, qualities that are bestowed only to a lucky few. Using these, they started the process of assembling all knowledge in a compact and easy – to – decipher form. 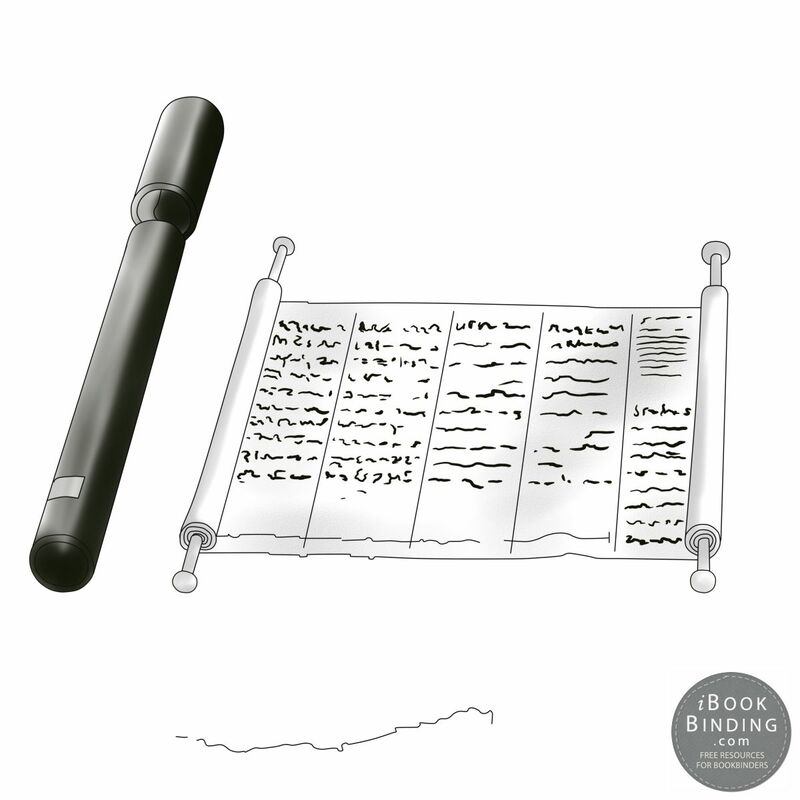 The roots of bookbinding lie in religious literature and history (timeline of Bookbinding from Cave Paintings to the Internet, courtesy of History of Information website. Also a small summary of the ‘History of Bookbinding‘ from Wayte Binding (UK)), and so the beginnings were associated with priests and churches. As such, the first ever books that were written and bounded together in the modern form, were on religion and science. In those days, the writing tools that were used resulted in the formation of large letters, as shown in figure 5. With this in consideration, the paper size was also large. 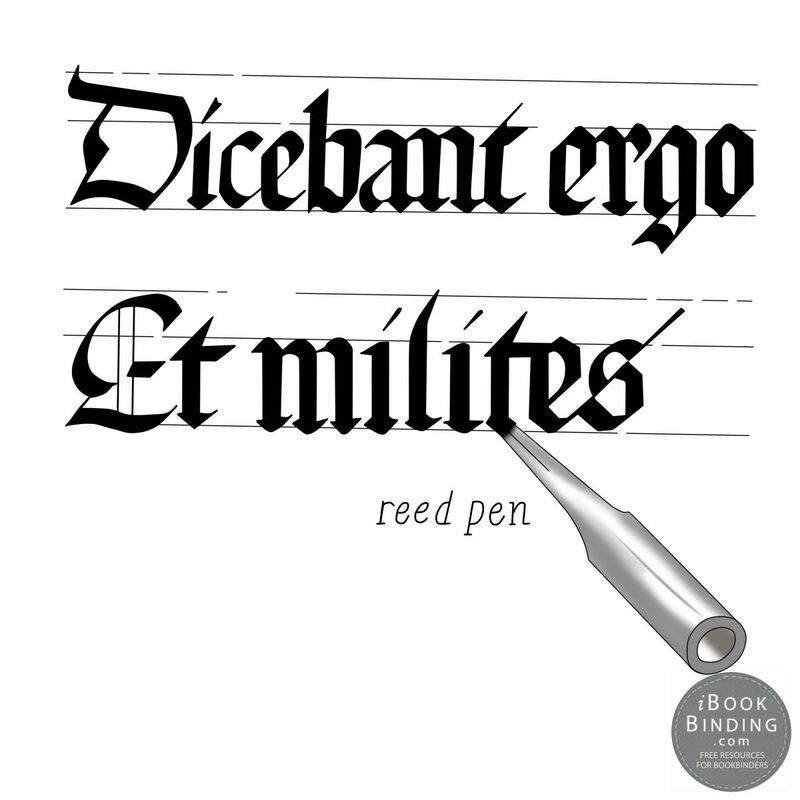 Generally, all writing onto books was done with a reed pen. The compiled books were often bulky and huge. Though, paper size did contribute to this, a more prominent reason was the thickness of the handmade paper on which the matter was written. With extreme patience, the people of those days carefully wrote each letter, word and line onto the pages. They had an artistic edge and decorated the text with calligraphic styles and brilliant colors. The covers which were used to protect these books also displayed flashes of bright colors, which can appeal to the eye even today. There are so many examples in this regard that anyone would be astonished with the creativity they reflect. Beautiful designs adorned with sparkling gems, precious stones, and gold leaves, the leather covers definitely had a lot to boast about. Figure 6 shows an example of a stunning book cover featuring an exclusive style. The creativity did not end with just the covers but was prevalent in all other aspects of the books as well. Even the boards were fixed closed together with gold latches or clasps that were adorned with engraved designs. The monastic binders utilized good and high quality materials in the process. They had a lot of time with them and had the proficiency as well. These two things were utilized by them to produce astounding work that speaks of quality in today’s era as well. The ceremonial books which were created were considered to be great works of art, and were to be used by only a selected class of people. They were usually beautiful and presented ample knowledge to those interested, but all this was not their greatest qualities. The most supreme attribute of old books was that they were literally one of a kind; they were unique and original, and none other could suffice in their place. As such, they were guarded with extreme care and were often secured with chains to the tables or shelves in whichever library they were kept. Figure 7. Paper being folded multiple times. Other factors which impacted bookbinding included papermaking. Originating in the lands between Europe and Asia, the tenth century saw the rise of this new methodology (see also History of Paper @ HQ PaperMaker). The paper at that time was made from hand, and roughly bore the same weight as the parchment. However, the facts that it could easily be folded and sewn together made it more preferable than parchment. As the art of papermaking spread across the globe, people realized that this new material did not always have to be given just a single fold. Instead, it was strong enough to be folded several times without getting damaged, as depicted in figure 7. If paper was folded two times, the resulting size was 9 inches by 12 inches, and if it was folded three times, the resulting size was 6 inches by 9 inches, the size of an average book today. The former style comprised of four leaves whereas the latter comprised of eight leaves. Paper was widely available, and it generated a new interest in the formation of books. Since the creation processes had become easier, more books on a wide range of subjects started to emerge. 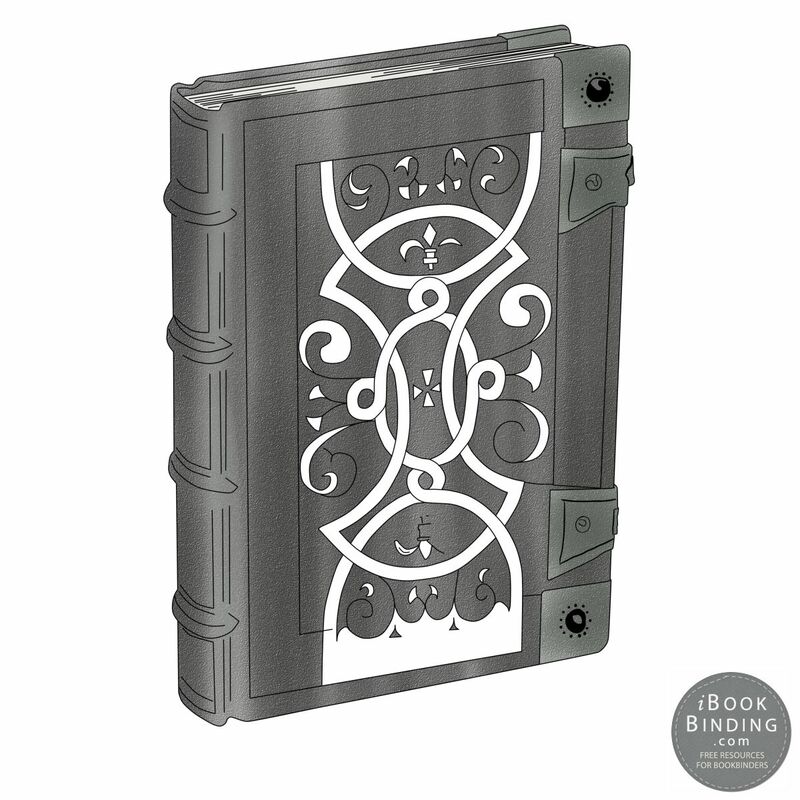 This led bookbinding into a new development phase or the era of the ‘block books’. The text and figures for each page were first imprinted onto wooden blocks, with one specific block for a single page. These were then used as stamps to create several identical pages bearing the same matter. The blocks could easily be stored so printing could be done even later onwards whenever the need arose. – A full history of WoodBlock printing at Wikipedia. The block printing method was faster than the traditional reed pen. Speed was not an issue, but it still had its own drawbacks. Cutting letters and figures onto the wooden blocks was a tedious and difficult task that was accomplished only after extensive efforts. Don't forget to subscribe to our YouTube channel to get access to HD videos of hundreds of Book Binding tutorials and reviews! 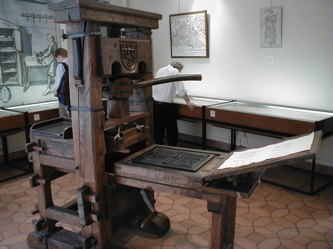 It was in the fifteenth century that Johann Gutenberg decided to end the issues with block printing, and proposed a new and revolutionary movable type print method. Individual type letters were pre-built, and words were composed with them. This made it fairly easy to set an entire page, and the printing process time was considerably reduced. Another advantage of this method was the fact that once a specific page had been set, it could easily be stored, distributed and used at a later time. Surprising is the fact that this innovative discovery did not immediately reduce the size of the books. This is because even though the letters were now being made by a different technique, their size was still the same as the lead and the block characters, at least in the initial days of their usage. What did change was the fact that the books could be printed in large numbers now and thousands of copies could easily be made. This lead to more books being circulated among the scholarly circles and the bookbinders were being hailed onto more and more for their valuable services. The immense attention created a revolution and the booking industry was transformed into a proper large scale sector from the mere cottage industry that it previously was. As time passed, the industry moved into print shops and later on was managed by separate building establishments. The 1800s indicate the start of the Industrial Revolution, which had its effects on the bookbinding industry as well. Machines began to be utilized in all manufacturing processes and started to replace the traditional and effortful hand techniques (more info here). In the bookbinding industry, the ‘mechanized’ methodologies had both their pros and cons. The time and efforts were significantly reduced but the new styles and designs were just a degradation, unfortunately. Previously, leather was attached through hand operation, but with the advent of machines, the whole panels were just stamped in one motion. This new method reduced the costs because a very little amount of time was needed now. Figure 10. Bookbinding Book Construction. As machine technology was utilized, the bindings also transformed. The advent of cloth tapes replaced the cords that were used in the sewing operation. This transformed the entire backbone or the side panel of the books. False bands were also attached to retain the look of the old binding, but the same effect could not be achieved. Figure 9 shows the backbone with false bands. 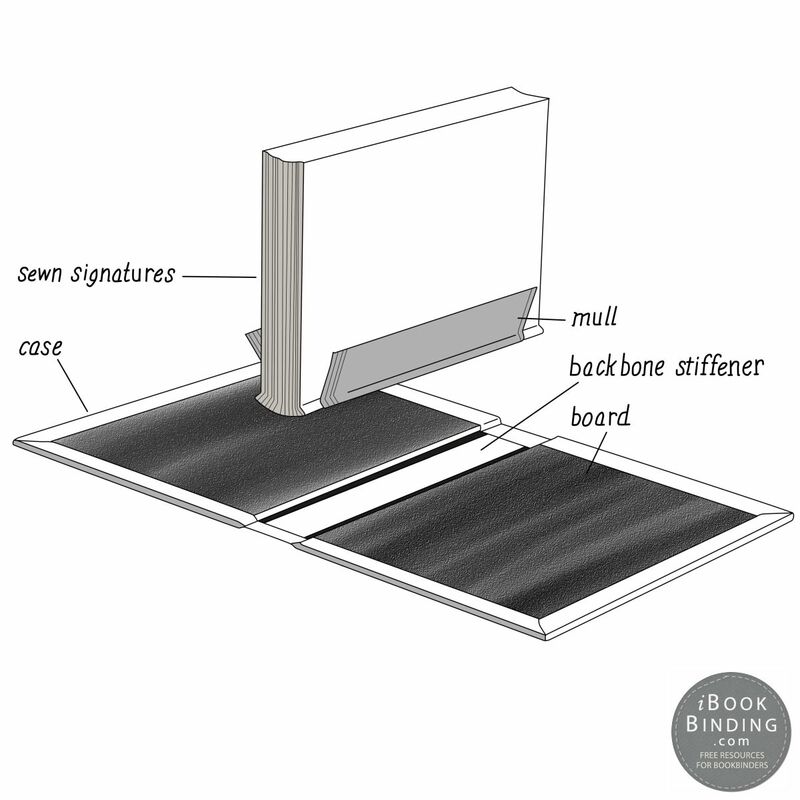 With further advancements, the new case binding also emerged which completely eliminated the sewn signatures. Instead the protective cover and the backbone were just glued onto a thick paper or a sheet of cloth, which formed a sort of a case. This case wad then fixed onto the signatures by means of glue, cloth and end sheets. This is shown in figure 10. Figure 8. Carving tools used to make wood blocks for printing. 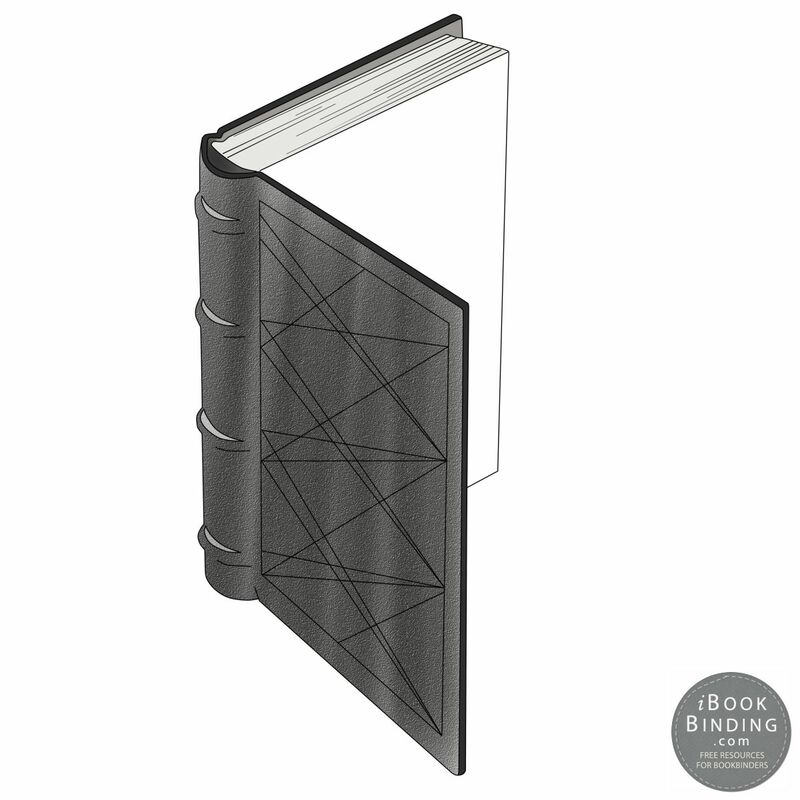 As the book industry underwent a revolution, the binding styles also evolved. The cover material was mostly leather but it did not just protect the pages; it hid the cords underneath itself. This transformed them into slightly raised bands, providing the book with a stronger support. Interesting designs started to emerge on the cover and the side panels as well. The traditional gold embellishments were still being used but in modified forms that improved the appearance. The panels also featured different designs that were made by impressing various hand tools onto them as shown in figure 8. The binding styles were particularly liked by the royal families of England, who not only supported them, but funded them as well so that they could be further developed. England was home to many skilled binders who adorned the covers with symbols of the elite class such as the crests and the coats of arms. These ‘royally’ designed books were only meant for the loyal libraries where they were safely stacked away among the existing piles. During this age, many skilled binders became famous in the industry, but what is weird is the fact that they came to be known by the people for whom they designed books, and not by their own names. Thereafter, the same names began to be used for their individual binding styles. For instance, the Grolier bindings originated from the reassures of France, Jean Grolier, Vicomte d’Aguisy in 1545. In the era of the machines, books could be bounded in just a short time. As such, the bindings became affordable for everyone, but they no more had their past creativity. The machines could have been used to evolve the binding styles, but at that time, more focus was laid on reducing the costs. Apparently, the designs still resembled the handwork embellishments, but the quality was just not there anymore. Perhaps the blame for this can be put on the cheap paper, the woven machine cloth or the shortcuts that were used to decrease the process time. Later on, efforts were made to achieve the look of hand finished binding once again. This happened when the cords were replaced by cloth tape. False side panels were attached onto the sewn tape, but the effect was from the past delicacy these panels had. In the case binding period, the decorations were just stamped onto the flat case, and depicted no shows of artistry. 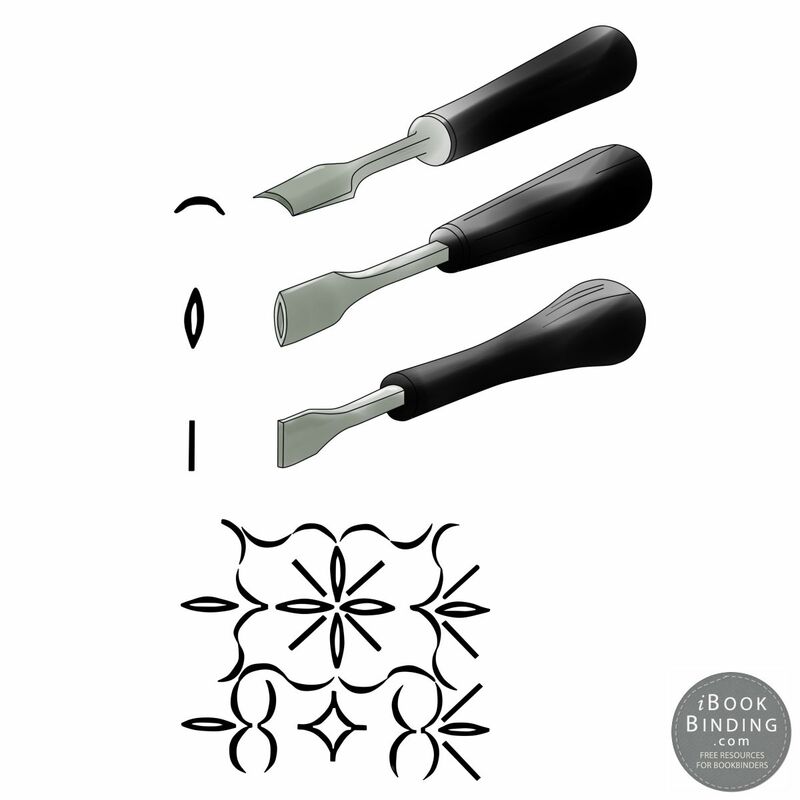 As the 1800s came to an end, machine methods dominated the bookbinding industry. Books were being produced in large numbers at reasonable prices, but obviously the past quality was just not there. It was in this time that a group stepped up and made attempts to preserve the fine bindings of the past at least to a certain extent. Led by William Morris, the group comprised of very skilled craftsmen that included the likes of T. J. Cobden-Sanderson. Together they made efforts and accomplished bookbinding in private presses. The processes used were similar to the traditional methods and utilized hand typesetting, hand presses and quality handmade paper to produce supreme books. In the olden days, the entire bookbinding industry used quality methods and produced fine books. The trends were set apart in the 1800s when mechanized methodologies degraded the binding quality to reduce processing time, making the books more available and affordable. From then onwards, fine binding became just a specialty, and was then practiced in isolation from the main industry. The market was also very small and comprised or private collectors and special libraries, who had a taste for not only the content but binding creativity as well. I would love to hear your thoughts and opinions on any of the topics discussed, please direct your words to the comments section below. I look forward to reading them. The minimum level of contribution is only $1 per month. However, starting with a pledge level of $5, our supporters get at least 2 digitized vintage books about bookbinding, book history or book arts per month from us! These pledges help iBookBinding to continue its work and bring more information about bookbinding and book arts to you!